AO hits the mark again with this stunning, exciting gritty from top to bottom work of art on canvas. canvas. The piece, like so many others of AO’s work, would be an excellent addition to any sports collection, stadium museum, man cave or to the personal collection of any Alex Gordon fan. A work in progress of Anthony “AO” Oropeza – “The Gordon”. 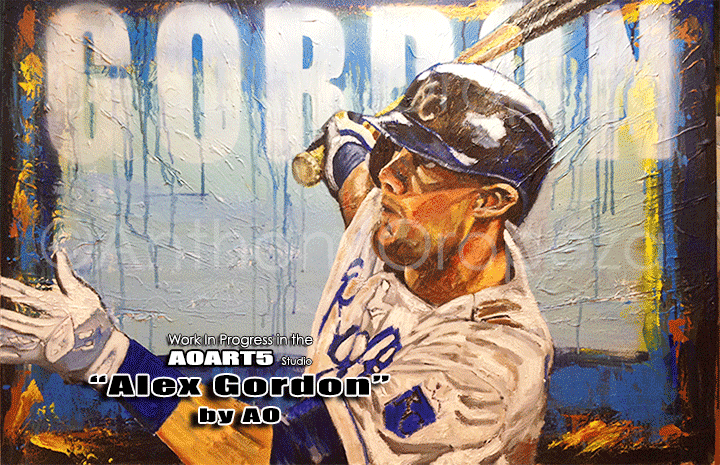 The 5th and final original piece of artwork for AO’s “Royals 5 – World Champ Series”, “The Gordon” is another magnificent work of sports art by AO inspired by the 2013-2015 Kansas City Royals teams. This masterfully designed work of art captures that slit second of one of Alex Gordon’s many memorable home run swings with that trademark follow through pose. Inspired by the 2013 season play from the Royals, AO started his series with the objective of just painting five pieces. Then viewers and fans noticed his work on line (web site, Facebook and Instagram) AO’s talent shined and popularity grew (and still grows). “The Gordon”, a two-foot by three-foot mixed media creation on stretched canvas, displays a heavily textured surfaced with the gritty and rugged look and feel that mirrors the way Alex Gordon plays day in and day out. 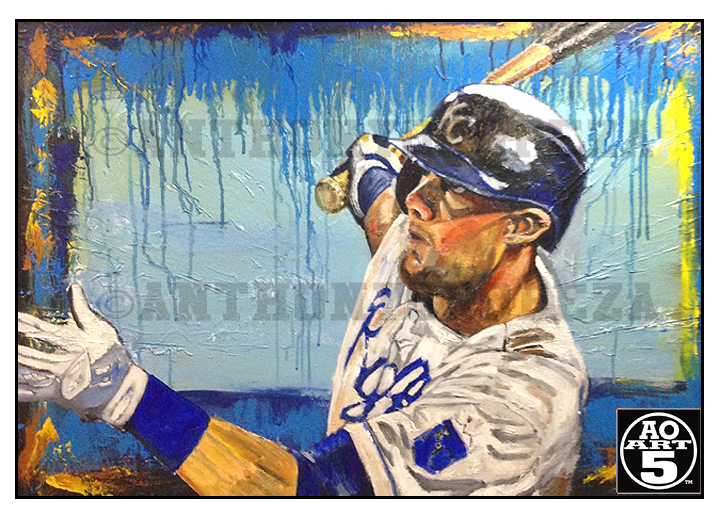 Get on the mailing list to be one of the first to receive a limited edition Alex Gordon print. Various sizes and styles will be available. Sign-up by visiting our CONTACT page and placing Alex Gordon in the subject field.